Sometimes, I don‘t know why I bother: The last three seasons, I watched Donald Trump’s reality show for someone in particular and that person’s always one of the first to get fired. 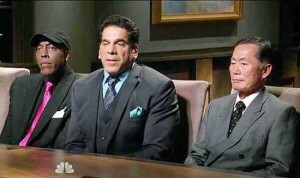 In the last season of “The Apprentice” (fall 2010) where everyday people actually competed to be hired by Trump to work for him, the former Miss Chinatown was the first person pushed out. Last year, I tuned into “Celebrity Apprentice” mainly to see David Cassidy, who hosted my unsold radio pilot “That Guilty Pleasures ’70s Show” in 2006. Yep, he was the first to (undeservedly) get the boot. In this latest installment of “CA,” I was excited to see George Takei representing our community (sure, Tia Carrere’s also Asian American, but she doesn’t have the same impact as Takei because of his “Star Trek” legacy, his involvement with the Asian American community, and his outspoken support of gay rights). Luckily, the women’s team lost two weeks in a row (as both times, two different project managers of the men’s team said if their team lost, they’d pick Takei as one of the two contestants at fault), so Cheryl Tiegs and Victoria Gotti were kicked out. This past Sunday, the men’s team, Unanimous, lost, and Takei was sent packing. The task was stacked against the men to begin with: Both teams had to showcase a fashion line designed by Ivanka Trump, Donald’s daughter, who serves as one of Donald’s assistants on the show… along with brothers Don, Don Jr. and Eric (Holy nepotism quadrupled, Batman!). Takei volunteered to be project manager because he felt he had a good visual sense. But (and this was something his teammates said about him the past two weeks), he didn’t always pick up on things as quickly as those around him. For instance, he thought they were supposed to design four windows when it was two. Takei assigned tasks to different people and didn’t micromanage them. So when his team lost and everyone seemed to have done the tasks they were assigned, Takei didn’t fight the common notion that if you’re project manager and your team loses, maybe you should be fired. As many expressed online, the men’s team should’ve won. Ivanka liked their sign for her product line so much, she wanted to use it for her own campaign. They had a good concept using three sets of twins to depict women during the day and the “same” women at night in two different windows. The pictures the women were supposed to use didn’t even get printed and their approach was scattered, confused, and even they had a difficult time explaining exactly what it was. Yet Ivanka ended up choosing the women’s presentation over the men’s. Who should be fired? In the boardroom: Arsenio Hall, Lou Ferrigno, and George Takei. Clay Aiken, the “American Idol” runner-up who later came out as being gay, mentioned how much he respected Takei for being a leader in the gay movement and that it pained him to have to say Takei should be the one to go. I’ve never been a fan of the usually pompous Arsenio Hall, but I was impressed that he almost fell on his sword, reasoning that if Ivanka didn’t like some of the clothes he picked for the windows, maybe it was his fault. Takei could’ve widened the hole Hall opened on Ferrigno, but instead, he told Trump this experience had been one of the best of his life and he regretted not being able to do more for his charity, the Japanese American National Museum (in the first week, the actor mentioned being born in an internment camp and this week explained he was helping JANM in memory of his parents). It was painful seeing Takei — an all-around good guy and goodwill ambassador for Japanese Americans and Asian Americans in general — leave so soon. But because of the respectful (and dare I say honorable) way he carried himself, he probably picked up more fans as a result. Surprise Star Department: A month ago, I talked about Heejun Han, the nerdy, unconfident Korean immigrant who spoke with an accent, auditioned for “American Idol,” and shocked everyone with his soulful voice. 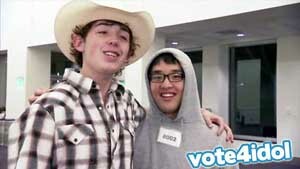 After going to the Hollywood round where contestants are forced to perform in groups, he was paired with Richie “Cowboy” Law, a southerner who told his team exactly what they should do and wouldn’t hear anything contrary to his opinion. Han told the cameras he was so turned off by Cowboy (admitting he didn’t even know his real name) and anything having to do with cowboys that he no longer even liked the Dallas Cowboys! I wasn’t the only one who began to think, “Heh heh, this guy’s actually pretty funny!” After their group managed to go on to the next round, Han admitted to Cowboy he’d said negative things about him, and he wanted to apologize to him and his family (how Asian of him!). Han didn’t give any standout performances (at least from what they editors chose to show), and if I had to bet, I would not have expected him to make the Top 24. Last week, the Top 12 men and Top 12 women performed on successive nights in live telecasts soliciting the votes of the public to keep them on the show. It was reported that Han got the loudest applause in the room. Then came word that he has the second-highest number of Twitter followers next to Philip Phillips. No surprise, then, that he was one of the men who received the top five most votes, guaranteeing him a spot in the Top 10 (the judges picked three additional people to fill out a Top 13). And the always “I don’t think I’m good enough” Han seems to have gained confidence: When host Ryan Seacrest revealed he’d made it into the Top 10, he just smiled as if he expected it. No hand-to-mouth look of shock as when he passed his initial audition in Pittsburgh. Our (22-year-old) boy’s growing up right before our very eyes. I hope Han’s demonstrated signing talent catches up to his popularity so he doesn’t end up leaving the competition prematurely, but it’s comforting to know he’s already got the audience in his pocket. Non-Racial Development Department: On “2 Broke Girls,” race is often raised in the one-liners, especially those shot off by Max (star Kat Dennings). She’s repeatedly made belittling jokes of Han Lee (Matthew Moy), the owner of the restaurant where she works as a waitress. So it was interesting that in last week’s episode, her roommate Caroline (Beth Behrs) fell for an Asian American guy, Edwin (Tim Chiou), who designed the duo’s cupcake website. They even slept together (off camera). Edwin took it as a sign that they were dating, but Caroline didn’t want a long-term thing, so Max shooed him away (a source at CBS says he’ll be back, though). For once, there was no mention of race. 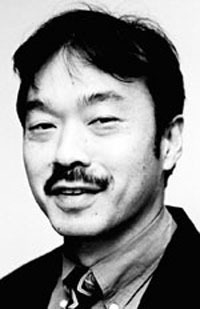 I wish there had been, if only to offset the stereotyped quips lobbied against Han Lee on almost a weekly basis. Max had already cracked that the formerly rich Caroline probably only dated white guys before, so why wouldn’t this have been a “shocking development” worth discussing? Open Your Eyes Department: NBC finally debuted its mid-season replacement “Awake” last week Thursday. It’s about a policeman (Jason Isaacs) who loses his wife and son in a car accident. Actually, when he goes to sleep, his wife’s still with him in bed but his son’s dead; when he wakes up, she’s dead but their son’s alive. The cop goes to see two psychiatrists in both worlds to make sense of what’s going on (they think he’s having trouble coping with the deaths). They’re played by Cherry Jones of “24” and B.D. Wong of “Law and Order: SVU.” It’s an intriguing series, and what the detective learns on a case actually helps him solve a crime in the other world. Thought this “high concept” show runs the risk of confusing its viewers, it’s fascinating, and the preview for this week’s show indicates some people are behind this strange phenomenon. Didn’t Think So Department: “Terra Nova,” one of the most expensive television shows ever produced, debuted to lackluster ratings in the fall, and its two hour-finale in December tied its lowest ratings. So it was a no-brainer it wouldn’t be back. Yet Fox kept dragging its feet on this one. Although President Kevin Spicer said he’d have to make a decision by January to give the producers enough time to mount a second season beginning September, he didn’t make it official until this week: It’s not coming back. The show was far from perfect, but it had potential and three Asian Indian regulars in the wife and two kids of star Jason O’Meara. Lou Ferrigno was born with a hearing disability that made it very difficult for him to learn to speak (he’s not completely deaf, but has always relied on hearing aids.) I don’t know if it is correctly characterized as a “speech impediment”. As a commentor just mentioned, Lou does not have a speech impediment, he is hearing impaired. At least check your facts before making statements like that. I dought that the fact that he is deaf affects his intelligence at all…another statement you probably didn’t bother to check. In spite of the fact that everyone on the team thought George was a great guy, he did not do his job well on this particular show .That would be very evident to anyone watching the show. The right person was fired. Good positive article until you descended into “cattiness” yourself with the wholly unnecessary and seriously off-the-mark crack about Lou. I won’t go so far as Carla in making it personal. I only hope you can use this as a lesson to improve, something Lou has always done in his life.